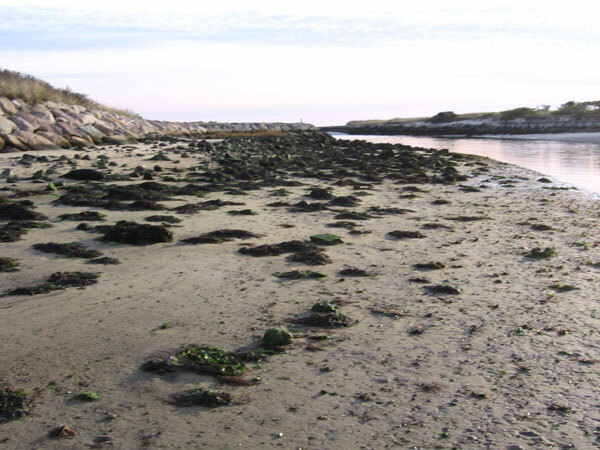 Once you know of a beach, inlet or other coastal area where soft-shelled “steamer” clams can be dug, you need to know how to identify where you should dig. Clams, being filter-feeders, live by the tide. During high tide their bed is underwater. At this time, they extend their siphons, or necks, to intake seawater. After the tide has gone out, clams need to eject this water to prepare themselves for the next feeding during the next high tide. This is your chance to dig them! Always dig clams at dead low tide. Tide charts are available at any salt water sporting goods store, from local weekly and daily newspapers or from the Internet. Tides on Earth are caused by the Moon’s gravitational pull, which varies according to the Moon’s orbit. A new or full moon always brings the highest and lowest tides. 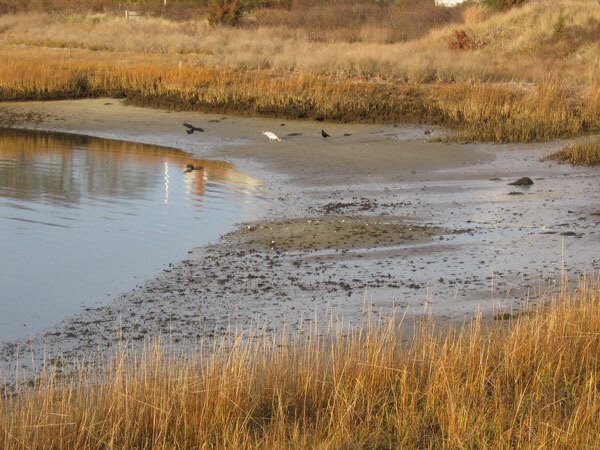 At low tide, clams eject water through their siphons into the air. Jets of water from clams under the sand can surprise anyone. They may reach three or four feet into the air! Should you see these jets, mark their location and begin digging immediately. These mean live clams are right there for you! As you approach a clamming beach, stamp your boot on the sand. Sometimes that can induce one or more clams to eject their seawater. 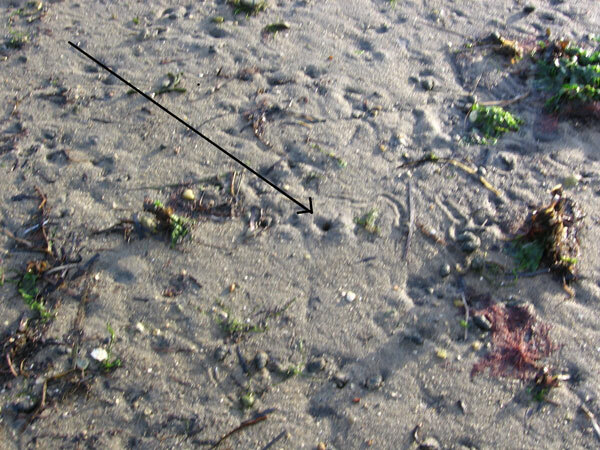 The most reliable method of locating clams under the sand is by the holes in the sand created by the jets of water. Any beach may have a number of different tiny holes in the sand. Holes about the size of a marble are home to fiddler crabs. Other holes do not involve biology and are nothing but the remnant of seawater that has receded. Sometimes holes are left behind by “sand crabs,” harmless small animals closely related to insects that children like to dig up. But we are after steamer holes. These are about the size of a large ball bearing. This blue heron is well camouflaged. 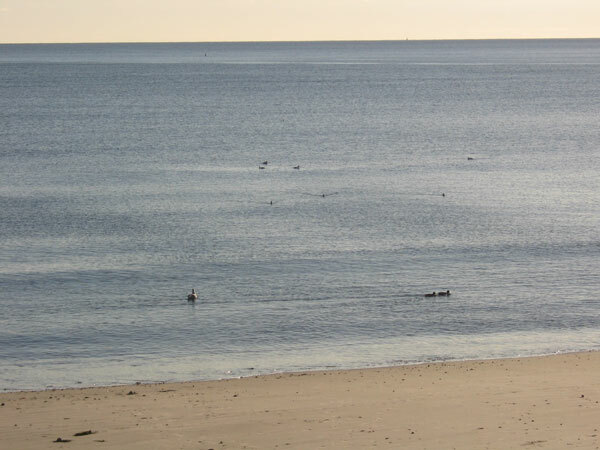 Seabirds higher on the food chain are an excellent indicator of areas with healthy, safe clams to eat. 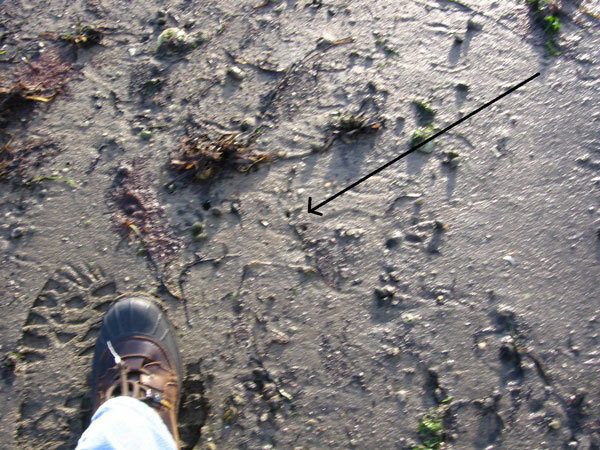 Look for exposed sands at low tide nearby. Here is a beach very likely to hold steamer clams. The birds are onto something. 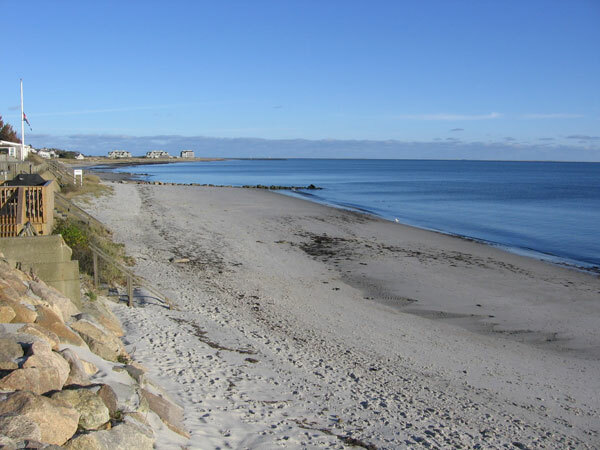 Note that the beach itself is sheltered, and a wide area is exposed at low tide. This bed holds both steamer clams and oysters attached to the rocks. The hole at photo center was made by a steamer clam ejecting seawater through its siphon. There are several other holes in this photo. They can be difficult to see. The hole at center is typical. Two steamer holes at center. The boot provides scale. The LL Bean Company of Maine manufactures excellent boots for clamming. This beach has little seaweed. 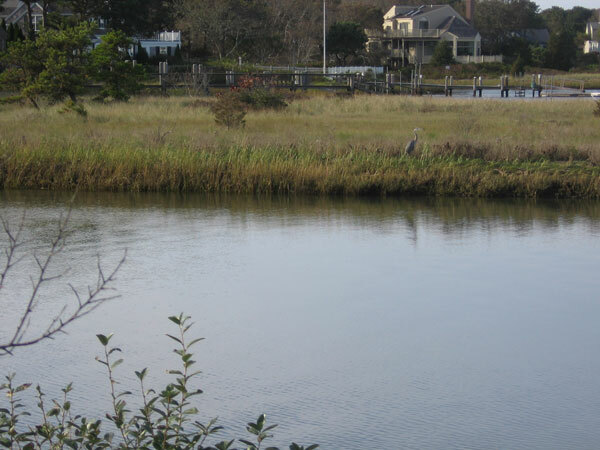 It is exposed to the wider water and not sheltered. We see no clam shells or other shells. It is a poor candidate for steamer clamming, although a few stomps with your boot at the water line at high tide are always a good idea, just in case. The sand is flat and without holes. No steamer clams here! But any day at the beach is a good day.